KITCHEN BLUES Music & Food in the Delta “If music be the food of love…or is it the love of food?” —Roy Blount, Jr. Tamales, catfish, barbecue, juke joints, and the blues. 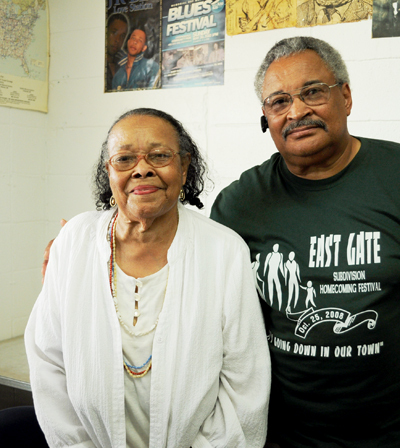 Explore the intersections between the musical and culinary heritage of the Mississippi Delta. The gin buildings at Dockery Farms. “I guess the Delta had the blues, and I guess that was better than barbecue.” —Bill Lester, Dockery Farms Read the Mississippi Blues Trail historic marker. 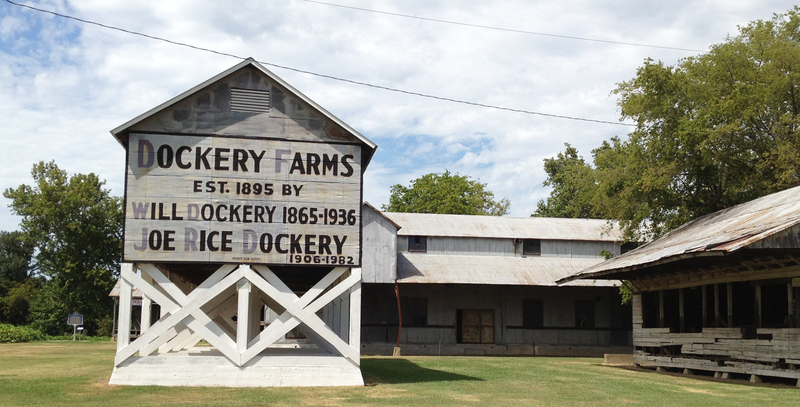 In the northern Delta, roughly twenty miles from the Mississippi River, is Dockery Farms. Tamales, catfish, barbecue, juke joints, and the blues. Explore the intersections between the musical and culinary heritage of the Mississippi Delta. The gin buildings at Dockery Farms. 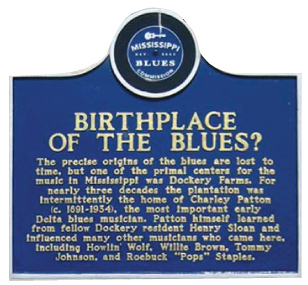 Read the Mississippi Blues Trail historic marker. In the northern Delta, roughly twenty miles from the Mississippi River, is Dockery Farms. Established in 1895, this plantation is widely believed to be the birthplace of the blues. The greats Son House, Charley Patton, Willie Brown, Tommy Johnson, Howlin’ Wolf, and possibly even Robert Johnson all played at Dockery. On weekends, sharecroppers and musicians gathered on the plantation commissary’s steps (the only food store for miles). Inside the commissary, just behind those early blues notes, were the staples of southern cooking: molasses, cornmeal, dried beans, sugar, salt, and flour. “These guys [would] show up on Saturday afternoon and they’d hit that first lick on that steel guitar…they’d slide that slide up on there and, man, the hair would stand up on the back of your neck,” explains Bill Lester, executive director of the Dockery Farms Foundation. Bill Lester at Dockery Farms in 2012. Ruth Blaylock Foster and Gentle Lee Rainey of Delta Fast Food. Hear Rainey on his grandfather's tamales. 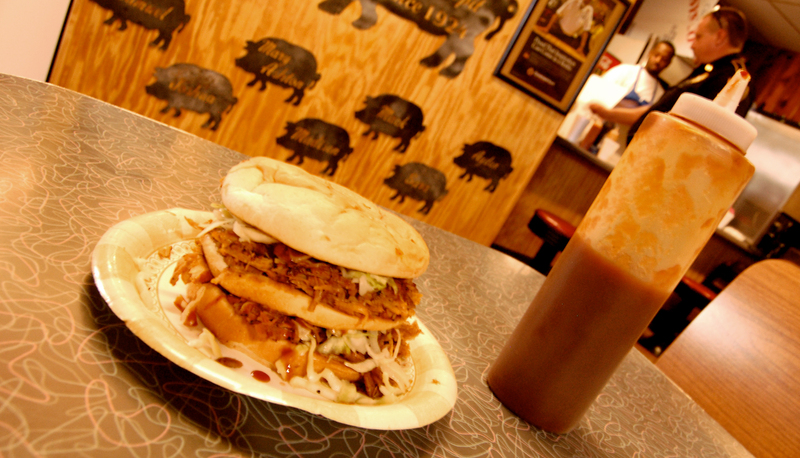 Abe's serves barbecue, tamales, and their own invention, a tamaco. 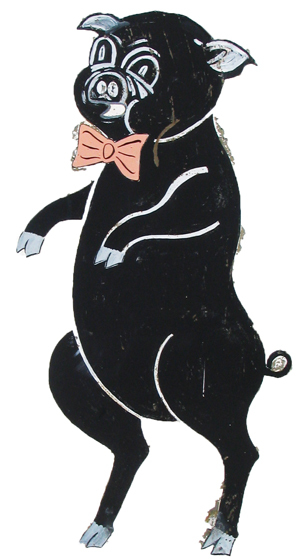 The pig on Abe’s Bar-B-Q sign. 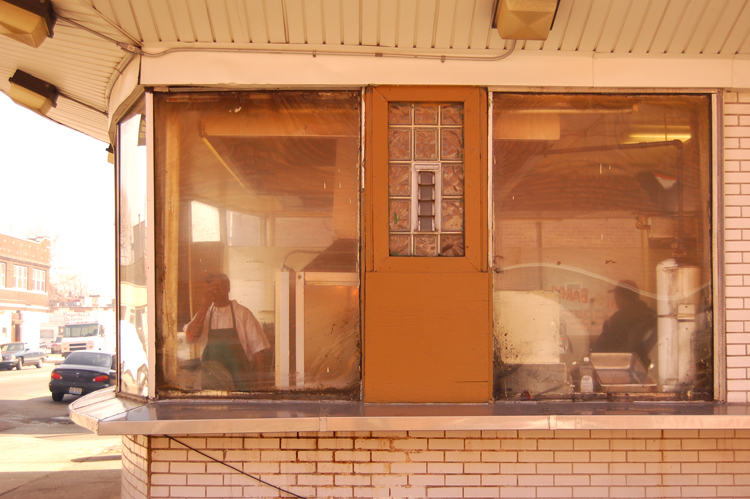 Abe’s Bar-B-Q opened its first location in Clarksdale, Mississippi in 1924. Not long after, legend has it, Robert Johnson made a deal with the devil at a crossroads to master the blues guitar. 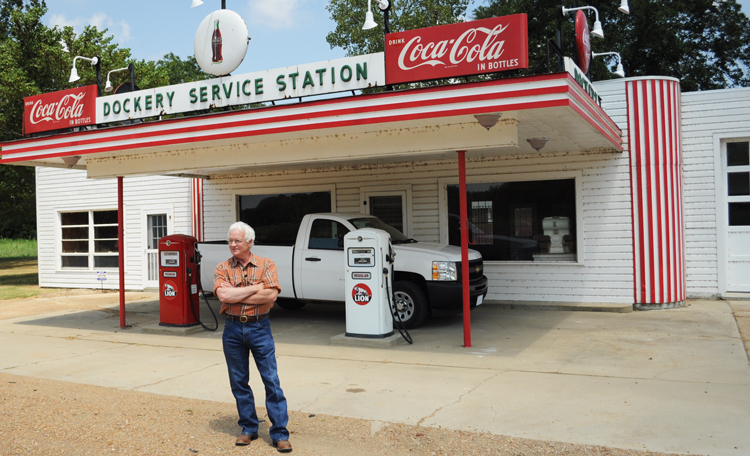 Since 1937, Abe’s has operated near the intersection of Highways 49 and 61. Abraham “Abe” Davis immigrated to the United States from Lebanon when he was thirteen and settled in Mississippi. After a few years training with a Greek restaurateur, he opened Abe’s where he served barbecue and corn husk-wrapped tamales that resembled the grape and cabbage leaf rolls of his home country. 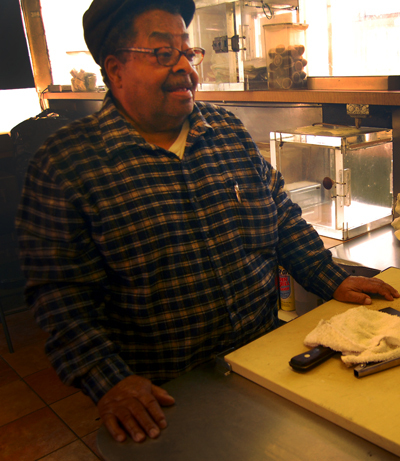 “Hot tamales and barbecue and blues go together,” says Davis’s son, Pat Davis Sr. Today Clarksdale is a destination for blues tourists, but in the early days of Abe’s, bluesmen were likely patrons. Davis Sr. remembers how his father refused to segregate the restaurant, instead choosing to welcome everyone. 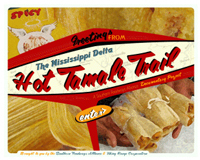 Explore the entire SFA Hot Tamale Trail. 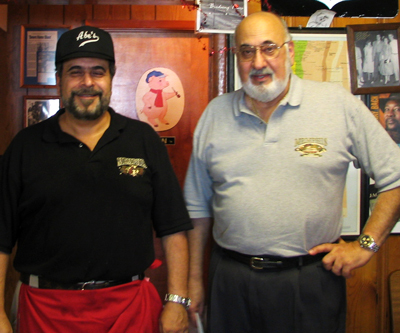 Pat Davis, Sr. (right) with an Abe’s Bar-B-Q employee. Hear Davis Sr. on his father's welcome policy. 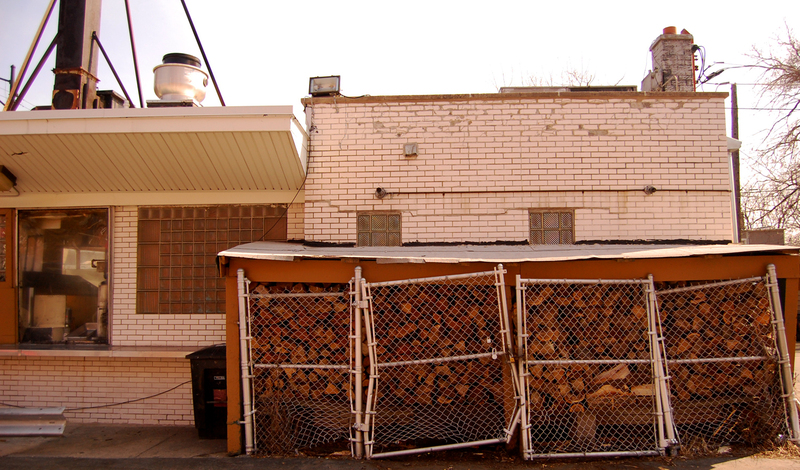 Wood for the pits at Lem's in Chicago's South Side. “People worked their way out [of Mississippi]. The pit at Lem’s from outside. James Lemons of Lem’s Bar-B-Q. Hear Lemons on his childhood friend B.B. King. James Lemons and his older brother grew up with B.B. King in Indianola. His cousin, Mary Shepard, owned Club Ebony in town for decades before King took it over. As B.B. and others brought the blues to Chicago, cooks and restaurateurs like Lemons and his father planted new roots for Southern foodways.